A listing of essential Badger State resources compiled by the�Wisconsin State Genealogical Society.You’ll find everything you need to get started on finding your Wisconsin ancestors. 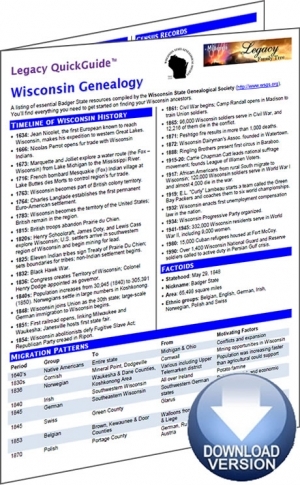 The�Wisconsin Genealogy�Legacy QuickGuide™ text contains useful information including a timeline of Wisconsin history events, tips on Wisconsin research strategy, a list of Wisconsin migration routes and more. Also included are over 100 links to websites and resources covering vital records, church records, census records, as well as general Wisconsin resources. This handy 4-page PDF guide can be used on your computer or mobile device for anytime access.